When fighting a speeding ticket in court, overcoming a radar reading can be one of the greatest challenges. Because most judges assume a radar measures speed with perfect accuracy and precision, arguing against a police officer or photo radar's clocking speed can seem futile, as if arguing against reality itself. However, a radar only measures speed with complete accuracy if it's perfectly calibrated and properly utilized. Calibration and user error will be themes of the defense. Write a motion for discovery to obtain the radar records. You can download templates for this from places such as Doc Stoc (see Resources below), but basically what you want is language saying you want to file a motion for discovery, followed by a list of the requested materials from the plaintiff which, in this case will be the following: radar documents (user manual and serial number), calibration log sheets, officer's certification, officer's notes and state and department protocols for operating the radar. If the ticket came from a photo RADAR, also request any pictures taken by the device. File the motion for discovery with the clerk of court. You can do this by mailing it to the court address listed on the citation, or by hand-delivering it. File the motion as soon as possible, as many courts require all motions to be filed at least three weeks before the court date. File a dismissal if the police department fails to comply with the discovery process. Send a dated copy of the motion for discovery, along with a request for dismissal to the clerk of court. Failure to produce the evidence in a timely manner will likely lead to a dropping of charges, in which case you win. If the police do provide the evidence, proceed to Step 4. Examine the discovery materials for helpful evidence. If you notice inconsistencies in the log or any history of defects in the radar manufacturer, you might include it as an exhibit in the defense case. You might also study radar-distorting phenomena such as the "cosine effect," which, according to Radarguns.com, is the effect of higher speeds being registered when the radar is hitting the moving object at a severe angle rather than straight-on. This effect can also apply to photo radar, which is why you should examine the photographic evidence to see if the radar clocked you outside the appropriate accuracy zone. Write questions to ask the officer in court. These questions should address areas of weakness you discovered through examination of evidence. If you doubt the officer's complete knowledge of the radar gun's proper operation, include technical questions about the operation to attempt to demonstrate this insufficient knowledge. If you suspect the cosine effect is in play, ask the officer to reconstruct the positions of the car to the radar. Or, if you suspect that the officer has not properly maintained and calibrated the radar, question her regarding the procedures and ask her to explain inconsistencies in the log. Similarly, point out any inconsistencies in the maintenance of a photo radar device. Listen to the officer's testimony in court. Be quiet throughout, making notes of further inconsistencies you notice in the testimony. Cross-examine the officer. Do not be domineering or use this as an opportunity to enact revenge on the cop you think wronged you, but also be secure in knowing that you are exercising a right. Present the evidence you compiled in court. Bring double copies of notes and visual aids that are clearly labeled, as you will be submitting one to the clerk for the judge and keeping one set to refer to during the case. Do not be brash or arrogant, but also do not be intimidated, or the judge may sense the uncertainty. If you are uncertain about a certain aspect, it is better to leave it out, as that will erode the credibility of the defense as a whole. Answer the judge's questions briefly and honestly. The officer is not a licensed attorney and is not allowed to question you, but the judge will ask questions after you present the case. Do not confess to speeding, even a little bit, and feel free to plead the fifth if you feel that answering a question might implicate you in another crime. Most importantly, do not lie, as this could result in a more serious charge of perjury. Await the verdict. The judge often renders it on the spot, but he may sometimes need to take time to review the evidence or a statute and will mail the verdict. Whatever the verdict, exit calmly and quietly so as not to incur any extra fines. Dallas, Ray. "How to Beat a RADAR Traffic Ticket." 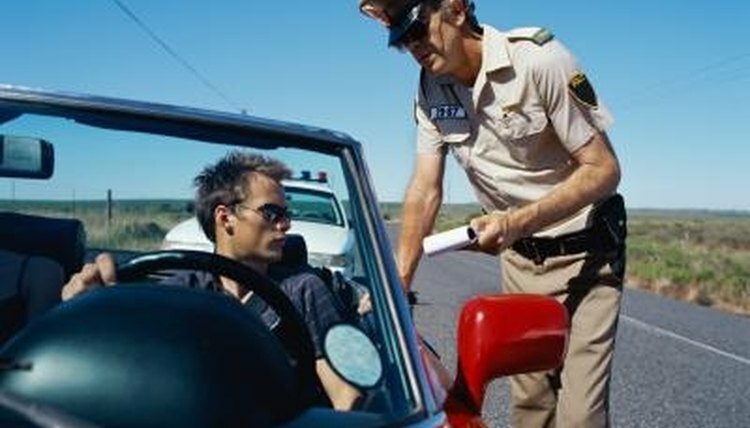 , https://legalbeagle.com/5912239-beat-radar-traffic-ticket.html. Accessed 21 April 2019. How Can I Get My Traffic Ticket Waived?